for test drives, but the advent of Remote Keyless Entry Systems with proximity key fobs have complicated their use. 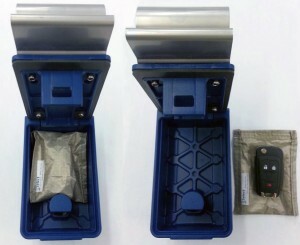 Select Fabricator’s RKE RF isolation key fob pouches fit easily into existing auto dealer’s key storage boxes preventing proximity key fobs from inadvertently unlocking a car. Select’s RKE Key Fob Pouches work with most key storage boxes including Supra™’s KeyAdvantage, Indigo®, Max and Magnum systems, as well as other key management boxes. Contact Select Fabricators’ engineering department to discuss your specific key storage system. Select Fabricators’ RKE Key Fob Pouches can be customized and labeled with dealer’s names and logos and given to customers to enhance proximity key fob security. RKE key fob pouches are made of NovaSelect™ silver/copper/nickel conductive fabric is also used by homeland security and the military organizations for secure communications**. This metal-coated rip stop nylon material is highly conductive and very durable for long lasting protection. Easily customized and labeled with dealer’s name and logo. *Trademarks of the respective companies. The use of Supra® company name and/or products does not imply endorsement of Select Fabricators, Inc. or its products. ** RF isolation is one part of a secure communications protocol. Please make sure your operation is in compliance with all sections of the protocol.